Electa Eggleston Townsend was a sister of Orson’s father Samuel. They moved to Litchfield, Hillsdale, Michigan where Robert died in 1860. Electa’s children and their families lived near her in MIchigan. Ambrose H. Eggleston was a brother of Orson’s father Samuel. They lived in Allegany County, New York and then were in Iowa during the time Orson served his mission. They later moved to Dakota Territory. Some family genealogical information was included in a 1873 letter from Ambrose to Samuel. Orson’s Missionary journal mentions that he visited his Uncle Ambrose in Parksersburg, Iown November 23, 1876. He probably gathered this information from him then. These “pencil notations” assumed to have been written by Orson were included at this point in the transcription. These people were not relatives. 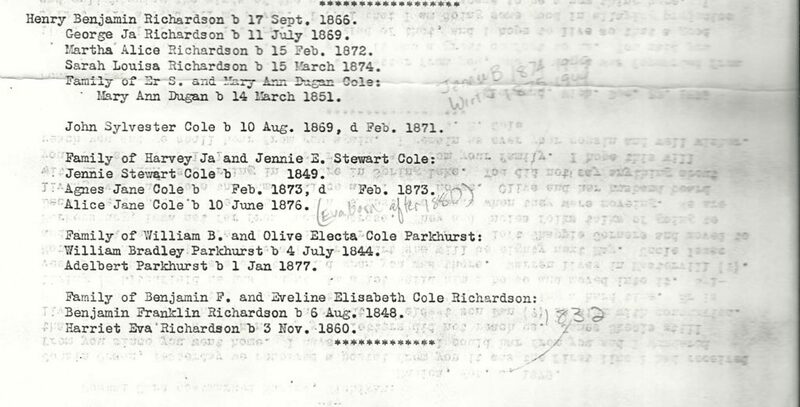 The mention of the marriage of Alice Davis and Moses Nixon in 1860 in Crescent City, Iowa would indicate that these were people that the Eggleston family knew while living there. Orson may have visited them when he stopped in Iowa on his way to Michigan. Anna Eggleston Skeels was Samuel Eggleston’s sister. Isaac and Anna remained in Springwater, Livingston, New York where they both died. Many of their children migrated to Michigan. Harvey and Polly Burgess were the parents of Orson’s mother, Lurania Powers Burgess. They moved to Shelby, Macomb, Michigan where Harvey and Polly both died. Many of their children and families were in Michigan when Orson was there. 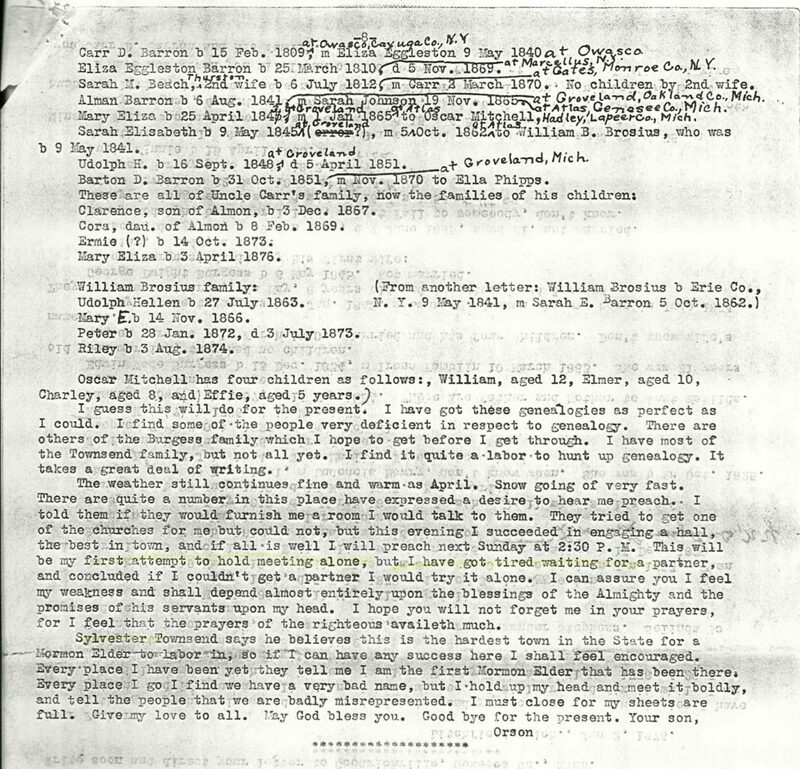 For some reason Orsen sent information on the Burgess family in two different letters, with more detail in the second. Eliza Eggleston Barron was Samuel Eggleston’s youngest sister. Eliza died in 1869 in Michigan. Carr and their children and families were living in Michigan during the time of his mission. I found the information in these letters extremely valuable. Though much information was in FamilySearch because of Temple work that was done, some family members were not in the system. I realized that at the time Orson went to the Temple in 1914, many of these people were still living. Some may have died but he might not have known that. 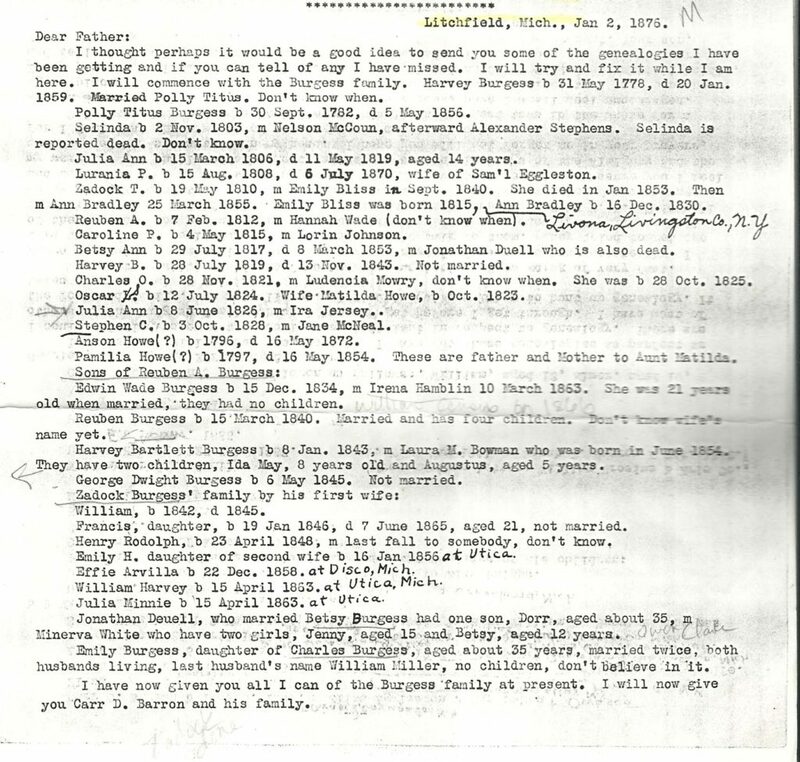 So with the information in these letters, I was able to add people to the family tree. 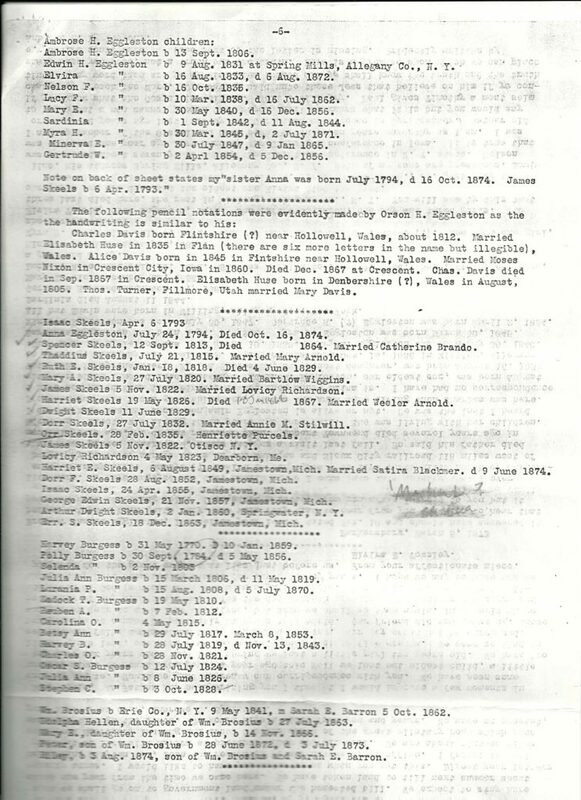 I also searched additional records and have added others based on what I found. Note: I made some pencil notes and highlights on these sheets before scanning my copies of the copies that Ruth had. The darker notes on the last two pages were made by someone else earlier. 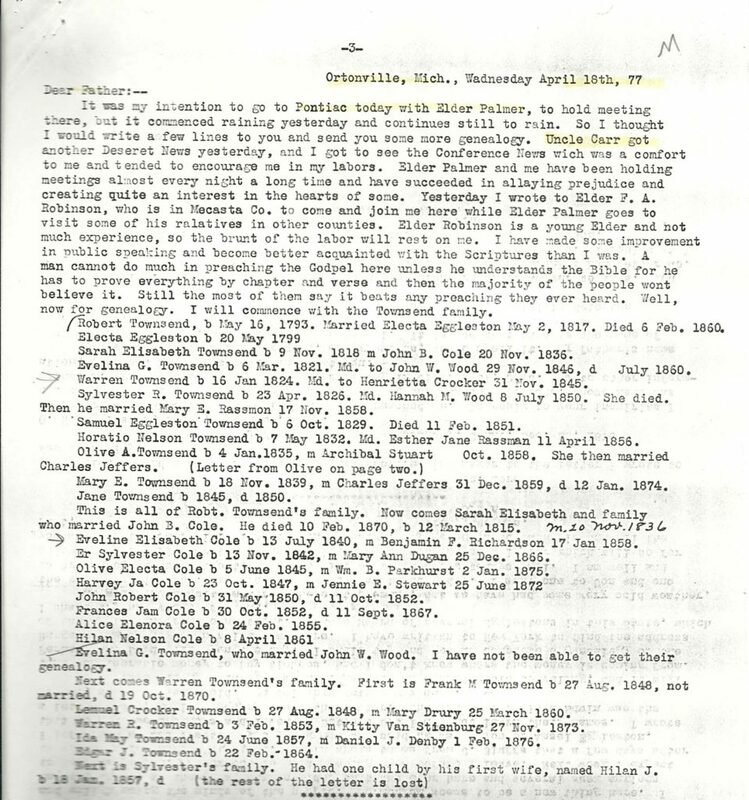 This entry was posted in Family heirlooms, My Stories of Discovery and tagged Barron, Burgess, Cole, Eggleston, Michigan, Skeels, Townsend. Bookmark the permalink.